Do you think starting a small business is what you always wanted to do? You can start by renting a space at the monthly Flea Market at the Bukit Timah Community Club. It’s on every last Sunday of the month, except when it’s the eve of/and public holiday. Contact Xander Loi at 6466 6115 for more info. Other details like email, look at the photo below. New leaflet that we received. 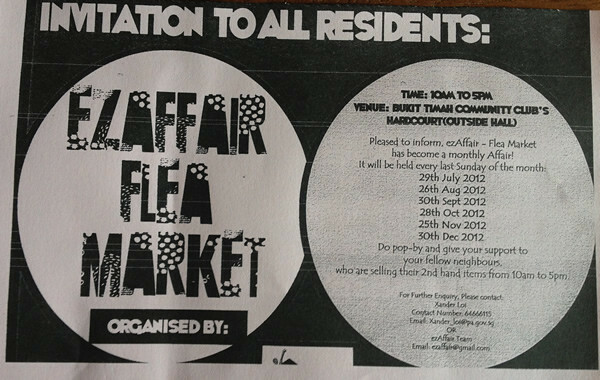 Hi, Are the flea markets at Bukit Timah CC still taking place each month and if yes, how can I rent a stall please? Thanks for the info! We have rented a stall for this month (March 31st) and really looking forward to it! Any feedback if the crowd at this flea is good? Hi … are the flea markets at Bukit Timah CC still taking place each month? If yes, how can I rent a stall & how much? Hi Veronica, you can contact the CC. They will be able to tell you. I think it’s still taking place. We walk past and see stalls being set up. I just saw your post and thank for your post that it able to attract the public to let others know about this event. If you don’t mind, I would like to leave my Facebook page’s link at here so that those visiting your blog able to like the page and find more information in it. Is the flea still on every last sunday of the month?